I could spend hours pouring over maps and atlases, and make boring rainy days indoors simply flash by. In the UK, official maps are published by the Ordnance Survey, a UK Government department which is the official mapping agency for Great Britain – but not Northern Ireland, if the omission of Northern Ireland confuses you, then CGP Grey can explain – not why the OS doesn’t cover Northern Ireland, but the whole UK/GB/NI distinction. Anyway, I digress. I live on the edge of South East London, well if I ask the Post Office I live in Kent, even though I’m a resident of a London Borough, have to pay for the Metropolitan Police, and get to vote for the Mayor. One of the advantages of living out here is that there’s lots of lovely green belt to go walking through. Now, the disadvantage. The OS make lovely 1:25000 scale maps (the “Explorer” series) which are aimed at outdoor leisure. The downer is that I live almost on the join of four of the map sheets, so when I go for a day out walking, I often need to take at least two maps, and as many as all four, with me, along with their extraneous detail of places I’m not going to, such as Lewisham, Peckham, Barking and Croydon. Before anyone asks “Why don’t you use your phone?”, even though you are tantalisingly close to civilisation and 3G (or even 4G) mobile data, you’re not that close. Deep in the woods, you’re far enough away to have poor or no service, and most mobile mapping products don’t have things walkers need like contour information. 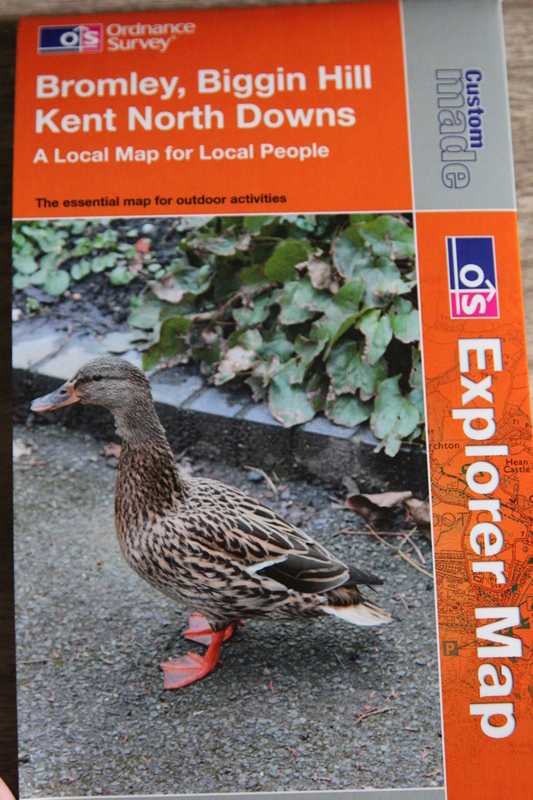 So, as quaint as they may seem in this age of satnav and gps, paper maps it is for your weekend amble through the local countryside. The boffins at the OS have a solution to “living on the join”: Custom Made maps (ta-dah!). You go online and define what area you want covered by the map (e.g. plonk your house, or somewhere close to it, in the middle if you like) and they will print it from the digital source maps, after you’ve given them some money (£17 in this case). You get to choose what it says on the front, and you can even upload your own cover image (or choose one from their library of inoffensive landscapes). Now that Summer is allegedly round the corner, I thought I had a perfect excuse to get one. No offence to Lewisham intended, but I’m tired of carrying you around in my day pack. They laser print it on some humungous laser printer, maybe have a bit of a laugh at your choice of subtitle, package it up and it lands on your doormat a few days later. Exciting, eh?